Eight performance pads and Serato DJ Pro integration. The RP-8000 MK2 is Reloop’s flagship direct-drive turntable designed for professional DJs. It is designed for seamless integration with Serato DJ Pro. 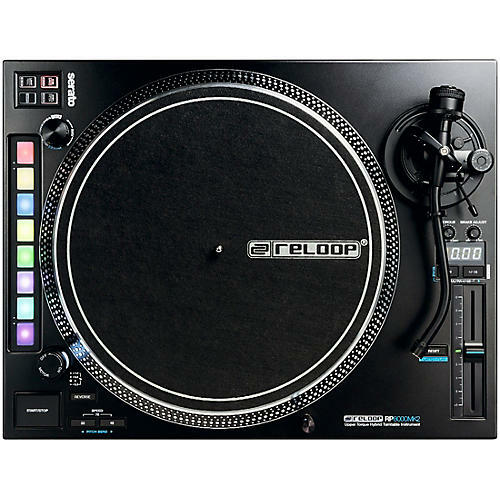 The Reloop RP-8000 MK2 features eight performance pads that can control seven different modes. Users can control the platter’s rotation speed in Platter Play mode to create melodies. The RP-8000 MK2’s unique features combine with its robust build quality to create a product that is equal parts record player and innovative musical instrument. Developed for use with Serato DJ Pro, the Reloop RP-8000 MK2 offers seamless plug-and-play functionality. In a digital vinyl (DVS) setup, it offers unlimited creative possibilities for modern digital DJs. The 8 large pads with RGB illumination can control over 7 different performance modes (Cue, Sampler, Saved Loops, Pitch Play, Loop, Loop Roll, Slicer), as well as 2 user modes, which can be custom assigned with individual preferred functions. Furthermore, by using the multi encoder it is possible to browse tracks directly from the turntable unit itself, and load them instantly to the respective deck. Thanks to its MIDI compatibility, the RP-8000 MK2 can communicate with every MIDI compatible DJ software. This way, an additional controller for performance modes is not necessary. Besides all creative improvements, the RP-8000 MK2 has everything a DJ turntable should be equipped with. A digital LC display shows information regarding pitch, BPM, deck assignment, scales and notes, elapsed/remaining time of current track, as well as firmware settings. In Serato DJ Pro, it is possible, for example, to show the current BPM value of a track, in order to exactly match your tracks without the need to look at your computer monitor. The smart USB connection is particularly sophisticated and can connect up to 4 turntables together via USB. The single units assign themselves automatically and constantly, so that only one turntable needs to be connected to a computer via USB. The newly developed aluminum LED target light in unibody design is freely moveable to enable you to find the stylus position in dark surroundings. The target light is also removable and easily replaceable. By using the buttons on the RP-8000 MK2's top panel, you can switch between the three motor speeds (33 1/3, 45 & 78 rpm). Dedicated buttons for forward and reverse mode allow for further creativity in your mix. A cutting-edge tool for the modern DJ—order today.